Content marketing can be a valuable tool for nearly any company, in nearly any industry, at nearly any point in the sales funnel. But with the glut of content available, how does a brand create and distribute content that allows the company (and the audience) to experience that value? We sent out a request for examples of awesome content marketing via HARO and other channels. In this article, we highlight four out-of-the-box case studies that show how content marketing can be used to create true value. Shutterstock is one of the largest online marketplaces for licensing royalty-free images, videos, and music. 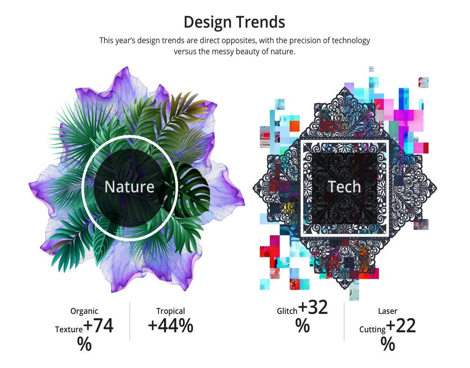 For its annual Creative Trends report, Shutterstock analyzes its customers’ search and download data to predict the styles and trends that will dominate the coming year and distributes results in the form of an infographic hosted on its site. Shutterstock uses its proprietary data to create something genuinely useful for its two audiences – customers and contributors. Creating one piece of content to serve multiple audiences is usually a bad idea. By trying to serve too many types of reader, you typically end up making your content too broad and readers lose interest. Contributors get paid when their content is downloaded. Being on trend allows them to make more money. 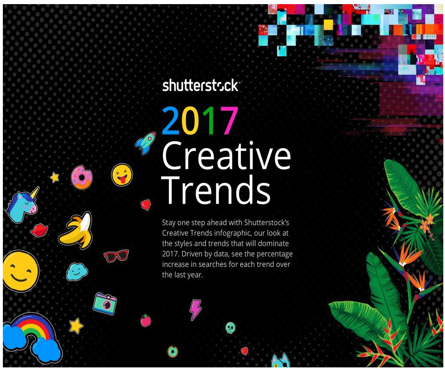 For Shutterstock customers, staying ahead of trends helps them ensure that the print materials, videos, and websites they are creating look fresh. And, rather than cutting its data 1,000 ways to produce a lengthy downloadable report, Shutterstock stays true to its brand and delivers the information in a succinct, visually impactful format. Focus on the value of your content to your audience. Content can only serve multiple audiences if it’s genuinely useful to multiple audiences. Consider using data you have rather than spending time and money building and promoting a survey. Don’t be afraid to share proprietary data if it could provide insights your audience can’t get anywhere else. SEMrush is a leading competitive research toolkit for online marketing. It has more than 20 research tools for SEO, PPC, and content marketing, and an expanding list of features. Although coming up with those new features hasn’t been a problem, telling its users about those new features has. SEMrush gamified its educational process with a virtual Easter egg hunt, challenging users to find 15 “Easter eggs” by completing desired actions within various SEMrush tools. SEMrush scored a big social media win by making it easy for users to tweet their accomplishments. This is an awesome example of how companies can apply content marketing outside of customer acquisition. It was probably a hard sell to spend more money and development time building a sitewide scavenger hunt after SEMrush presumably spent a decent chunk of money developing new features. Many of the best SaaS companies are using content marketing to drive customer success by creating user academies and certification programs. Gamification of the tool set guided users through adopting new features. It’s a novel, entertaining approach. Finally, by making it easy for users to tweet their accomplishments, the SEMrush team scored a social media victory on top of driving user engagement. Use content marketing outside of customer acquisition. You invest time and resources improving your products and developing new features. Spend time and resources developing a campaign to drive new feature adoption. The best performing content is interesting, informative, and interactive. PureVPN is a paid virtual private network service that uses end-to-end encryption to provide online privacy and security to its users. Pure’s simplified user experience is geared toward females who want to reduce their cyber footprint with private, secure web browsing. The advantages of using a VPN are well understood within the tech community. But communicating that value to non-tech female consumers is a challenge. PureVPN created a campaign that appeals to a group of consumers who could directly benefit from use of a VPN: past and potential victims of cyberstalking. Pure created a campaign page with striking visual images and a knowledge base of information on cyberstalking, including interviews with security experts and high-profile victims (Kris Degioia, a former vice president of marketing at Google and past victim of cyberstalking, among them). PureVPN used stunning imagery to evoke emotion and engagement around the topic of cyberstalking. This is an example of what can happen when companies get out of their swim lane and do it well. It works here for two reasons. First, PureVPN treated this emotionally charged subject with the utmost care. Other brands have tried to leverage sensitive topics in the past only to watch it blow up in their faces like Pepsi’s ham-handed combining of Kendall Jenner and imagery from the Black Lives Matter movement. Second, PureVPN offers a product that directly addresses some of the factors that put one of their key demographics at risk. Pure also made sure to put adequate effort behind promoting the content. It implemented an optimal social media strategy to push the content and contributed to discussions within online communities to start the campaign awareness – a terrific example of guerilla PR tactics that took a lot of sweat, but likely minimal budget. Finally, Pure made it easy for consumers to contribute to the conversation. According to its marketing department, within days of launching the campaign, PureVPN received submissions from users sharing their cyberstalking stories and providing tips on how to fight and prevent cyberstalking. Step out of your swim lane when and where it makes sense. Just because you make a tech product doesn’t mean you only have to market to a tech audience. If you choose to leverage an emotionally charged issue, add value to the space. Be aware of the possibility for backlash if your treatment of an issue is disrespectful. Put your weight behind promotion. 24Slides is a team of 65-plus of the world’s best – as the company claims – PowerPoint designers based between Copenhagen and Indonesia. They design presentations for companies with high volume demands. To build its email list, 24Slides created a fully editable, 20-slide corporate PowerPoint template, and gave it away. To access the template, customers enter their name and email on a home page popup, comment “yes,” or share it as a LinkedIn Pulse article. 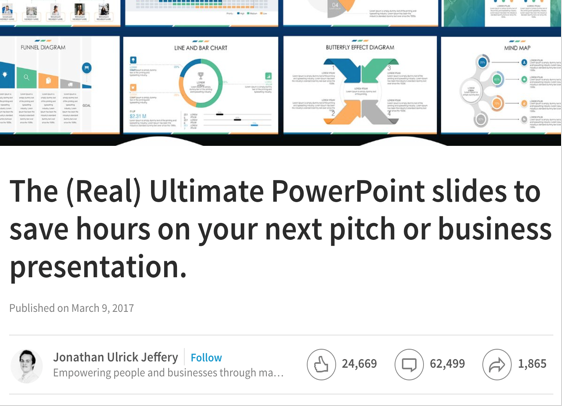 24Slides requires users to comment or share its LinkedIn post in exchange for a download link to ensure that the campaign has maximum reach. 24Slides has replicated the campaign three times, with similar results each time, growing its email list to 130,000 subscribers. Offering a downloadable piece of content in exchange for contact information is a classic top-of-funnel tactic for gathering large volumes of unqualified leads. But there are three things of note about this campaign. First, this is a great way to build a fast email list. Rented lists are the worst. With this campaign, 24Slides is giving away one of its core services. That’s a risky-feeling move that many companies don’t make. But 24Slides wasn’t focused on the potential cost of the campaign. It was focused on building a monster email list quickly. Second, by requiring users to comment on or share a LinkedIn Pulse article, 24Slides effectively gamed the algorithm and ensured some level of virality. The more people interact with a LinkedIn article, the more likely the platform’s algorithm will designate it a useful piece of content and serve it to more people. Finally, once 24Slides had a template for a winning campaign, it was able to replicate it several times with equal success. Building a quality email list should be a priority for your content. Email lists are one of the most valuable marketing assets available. To build a list fast, you must take a risk and offer something really valuable to potential customers. Content marketing isn’t always an obvious choice for your company. 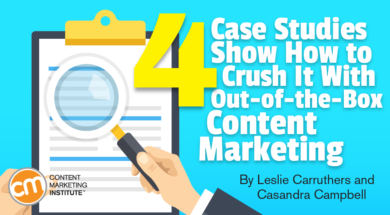 But, these four case studies are excellent examples of how content marketing can be useful in nearly any industry, at nearly any stage of the sales funnel. Gather more out-of-the-box ideas and inspiration at Content Marketing World this September in Cleveland, Ohio. Register today and use the code BLOG100 to save $100.